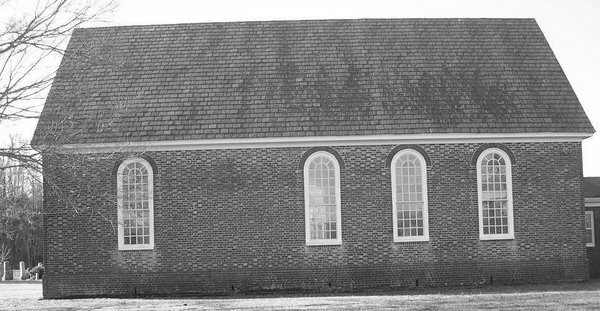 This medium-sized church, 60' x 30', has much to recommend itself despite extensive repairs to its brickwork, windows, and interior. 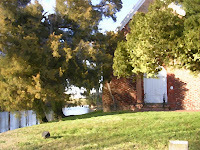 It stands in the middle of a copse of beautiful shade trees by the side of a small pond running to Cedar creek. 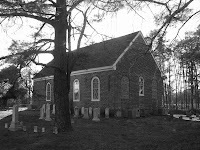 It is apparently the third church on the site, and is the only church not oriented but has the chancel skewed to the northwest instead of true west. I wonder if the builders oriented the church to the site and only roughly east-west? Another unique feature is that it is laid in Flemish bond below as well as above the water table. Old pictures I found in a book by George Mason in the nearby TCC library show the church with a collapsed roof and report extensive restoration to the brickwork that is evident even to a non-architect's eye like mine. The effect of the windows is greatly diminished by the nineteenth century panes with diamond panes and translucent lights. Perhaps I've been visiting too many remote churches with superb brickwork or recent, seamless restorations like St John's in King William County. I seem to recall it in a better light when I used it as a stop on bicycle routes home on summer days, so the church has probably remained the same and my eye has been spoiled. As I mentioned, the brick facades show extensive repairs with some of the windows showing changes in shape and size. 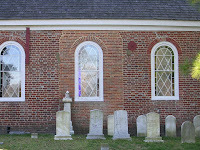 The windows on the chancel end are bricked up in an unattractive, contrasting pale brick, and the lunette window over the entry door is cemented over. 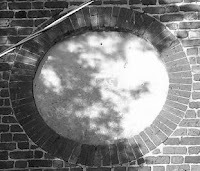 There is a large brick patch on the south-east center window (this is apparently the original vestry door?) and ungainly metal straps on the sides. Remember that this is nitpicking; the overall impression, especially from the south of the entry door is truly charming and pastoral. The view from the road through the trees is suitable for a moody watercolor.